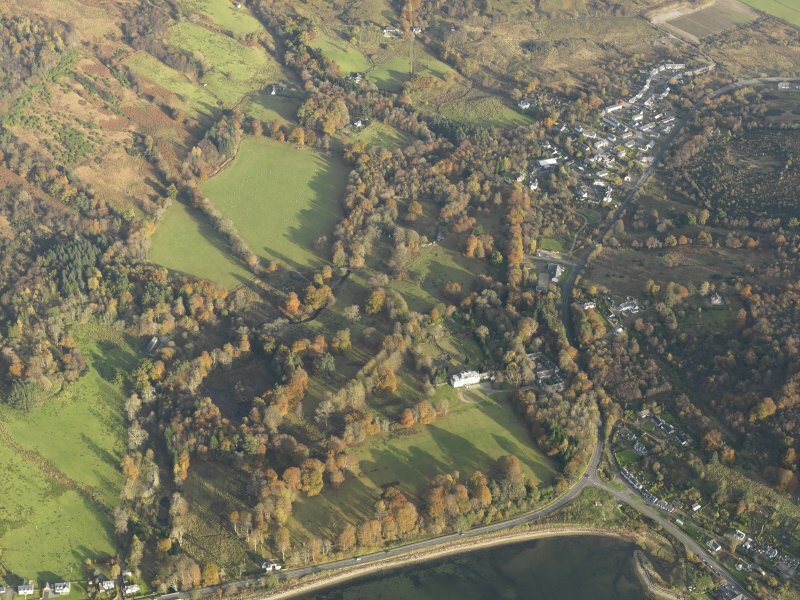 General oblique aerial view of the village centred on the house, taken from the WNW. 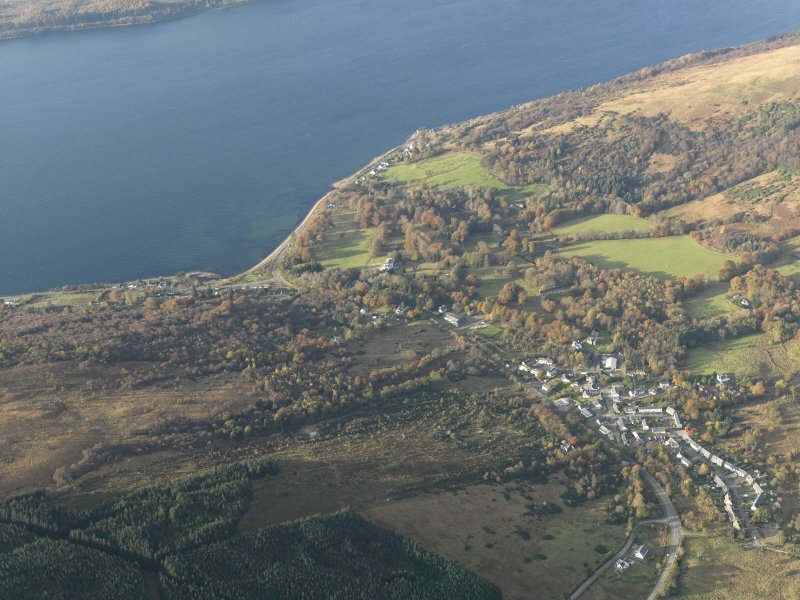 General oblique aerial view centred on the village, taken from the SE. General oblique aerial view of the village centred on the house, taken from the SW. 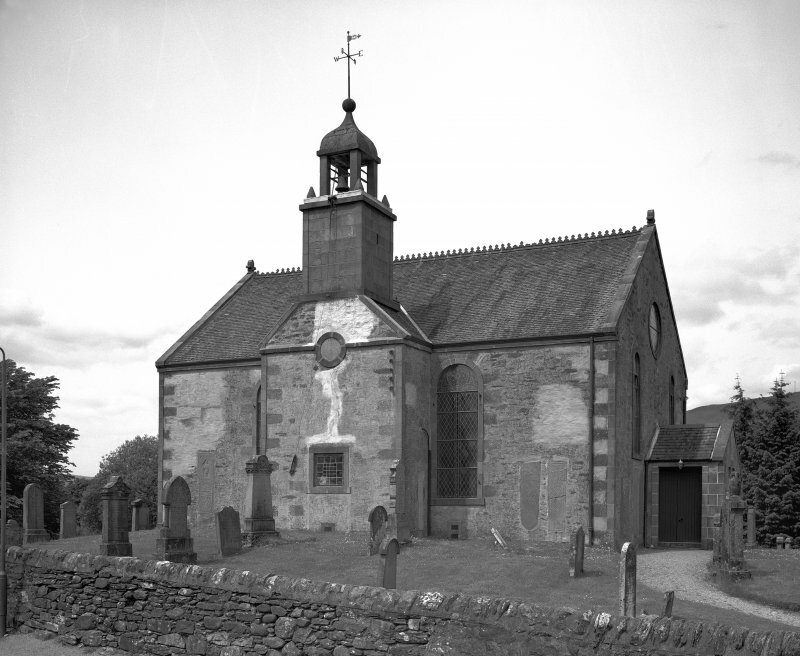 The name of Strachur church is Kilmolash, later corrupted to Kilmoglash. This suggests a dedication to St Molaise. The circular form of the old burial ground is indicative of an early Celtic site, and the fact that the church stands on a mound may mean that there are earlier foundations beneath. The medieval scupltured stones built into the wall of the church, which was built in 1789, came from Chapelverna (NN10SW 1). M Paterson 1970; G Hay 1957. Eleven scupltured stones are built into the wall of the church, which is still in use. Other than a small stretch of curvilinear bank to the SE of the church, there is no evidence to suggest an early Celtic site. Unable to verify dedication. Visited by OS (D W R) 28 February 1973. N.B. This reference applies collectively to NN00SE 10.00, NN00SE 10.01, NN00SE 10.02, NN00SE 10.03 . Description: Church with sculptured stones and grave slab; burial ground associated with a church consisting of circular burial ground surrounding church, with burial enclosure and two burial ground extensions adjacent. For a full description of the building, and the funerary monuments of medieval and post-reformation date, see RCAHMS 1992 No. 101. This church is situated 0.7km from the E shore of Loch Fyne, on a slight knoll within an oval churchyard on the N side of Clachan village street (en.1*). It is a rectangular building with a projecting centrepiece on the S front, formerly a porch and now a vestry, which is surmounted by a bird-cage belfry. The masonry is of rubble with advanced quoins and dressings of red sandstone. As originally built in 1789, the church was hip-roofed with doorways and two storeys of windows in the end-walls, but in an extensive restoration of 1902-3 the gables were raised and each received a central wheel-window above two tall round-headed windows, while the two existing windows in the S wall were altered to the latter form (en.2). The W doorway was blocked, and subsequently the E door was enclosed in a porch. The interior was completely remodelled, with new stained-glass windows and other fittings, and the only early feature is a bow-fronted E gallery with narrow fielded panels, supported on two timber pillars. 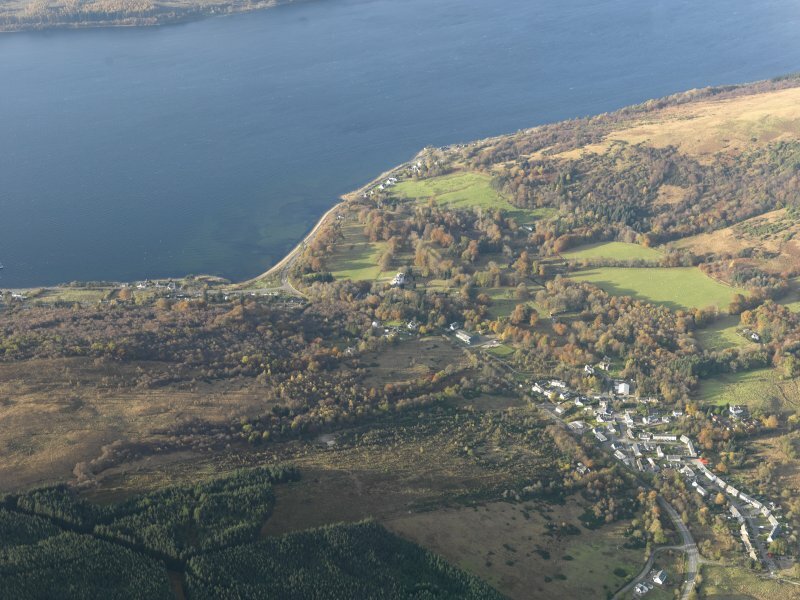 The parochial status of Strachur in the medieval period is uncertain, and when first recorded in the 17th century it was part of Lochgoilhead parish. However, Pont's map of about1590 showed an ecclesiastical building at 'Kilmalash', and early 17th-century accounts refer to a church at 'Kilmaglash' or 'Kilmaglais', while a sasine of 1632 mentions the 'chapel of St Malaise’ (en.3). A Latin charter is said to refer to the 'capella Sancti Malaci', and the dedication was evidently to one of the Irish saints named Molaise, probably Laisren or Molaise of Leighlin (Co. Carlow) rather than his namesake of Devenish (Co. Fermanagh) (en.4*). 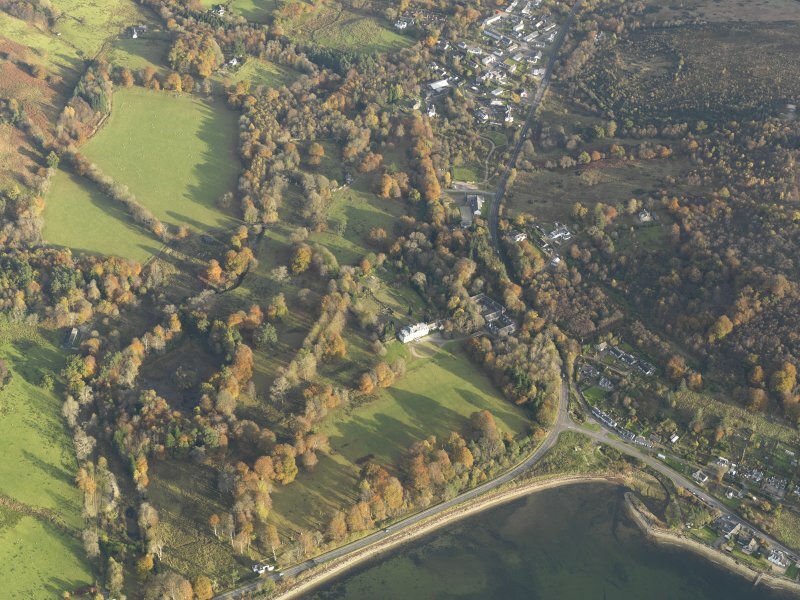 In 1642 it was recorded that the people of the 80 merklands of Strachur had 'builded a church to themselves', which was to be served by the minister of Lochgoilhead, but in 1650 it was separated from the latter and united to Strathlachlan. 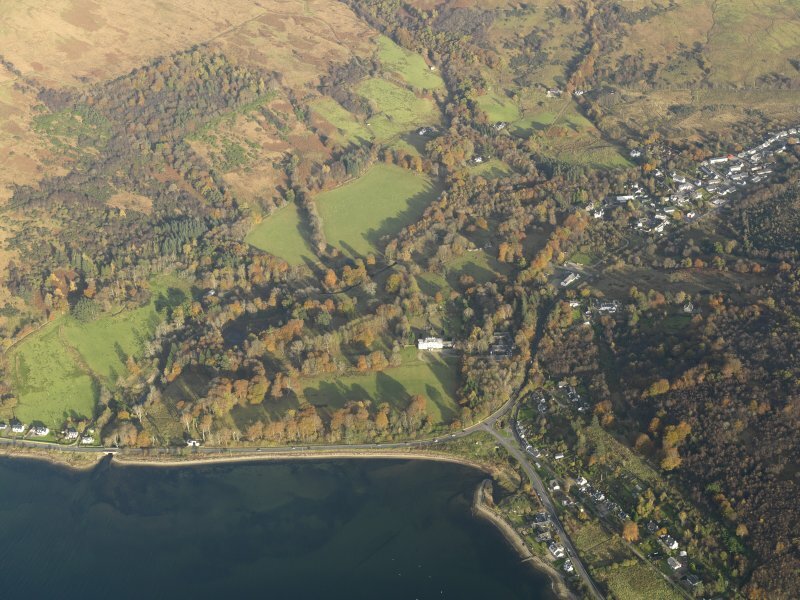 As defined at that time, the parish extended along the SE shore of Loch Fyne from Strachur to St Catherines, and inland to include the N end of Loch Eck, which was disjoined from Kilmun (en.5). The church was described as ruinous in a petition of 1698 (en.6), and an inscribed lintel (infra, number 1) may indicate repairs at that date, but there is no other evidence of the form of the building. The rebuilding of 1789 did not attract the notice of the local Presbytery, and was presumably carried out in conjunction with General John Campbell, the principal heritor, who is buried in the church (infra, number 20). It was described in 1843 as being 'in need of repair' (en.7), but any work carried out at that time has been obliterated by the repairs of 1902-3, for which the contractor was the local builder Archibald Fergusson.